~ makes enough for 2. Dinner sized portions. 1/2 tablespoon of oil, I use rapeseed (canola) oil. 1/2 of a large onion, finely diced. 1 breast of chicken, cut into 1 inch cubes. 1 cup of frozen soya beans, although peas, green beans or broad beans will do. 1/4 cup of grana padano, or parmesan. Add the oil to a frying pan under a medium heat, once the oil is hot, add the onions. Leave for a couple of minutes to soften, they should not brown. Then add the garlic and continue cooking for another minute, before adding the diced chicken, cooking for around 5 minutes, stirring occasionally. Add the Orzo pasta, mushrooms and stock to the pan. The stock should just cover most of the pasta. Leave to cook for 5 minutes, stirring to stop it from burning, and adding a little more water (and turning down the heat) if it starts to dry our too quickly. 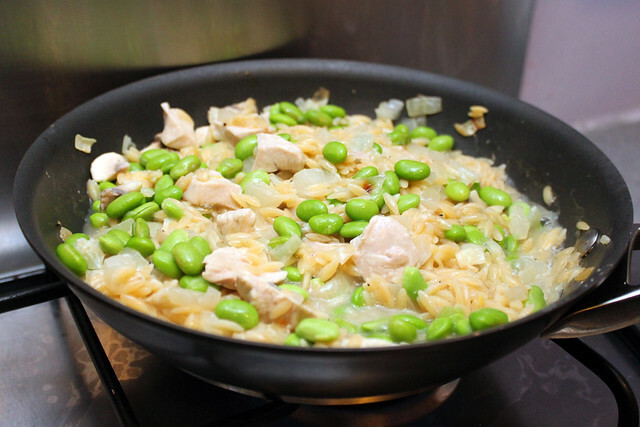 Lastly add the soya beans and half the grana padano, stir and cook for another 3 – 5 minutes. It should be sticky but not wet, and the pasta should be cooked through. 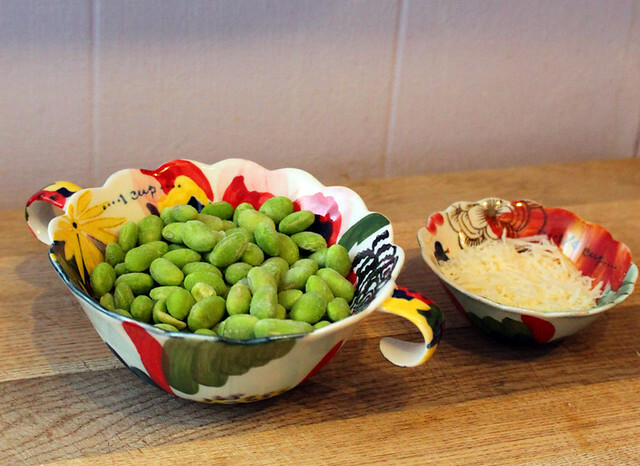 Serve with a sprinkling of grana padano. This is an amazingly quick dish, and as versatile as a risotto, the variations are endless and all at the speed for a healthy week night meal.